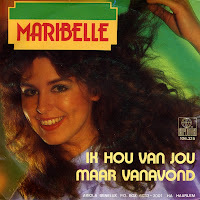 Hard to believe, but it's twentyfive years ago that Maribelle represented the Netherlands in the Eurovision Song Contest with 'Ik hou van jou' ('I love you'). The song finished 13th in a field of 19 competitors ('below Turkey', the Dutch rightwing newspaper 'de Telegraaf' cried in outrage). When you hear the debilitating noise of this year's Dutch entry, it's hard to believe that this country was once able to come up with a simple and effective ballad like this. The song has been covered by artists like Cilla Black, Engelbert Humperdinck, Jose Carreras and John McCook (yes, the 'Bold and the Beautiful' actor). 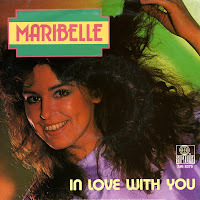 Maribelle didn't have a big hit with this in the Netherlands: the single peaked at number 33 in the Dutch top 40. She also recorded an English version, 'In love with you'. Before representing the Netherlands at the 1984 Eurovision Song Contest, Maribelle had already competed in the National finals in 1981. She sang two songs: 'Marionette' and 'Fantasie'. She didn't win the competition (which was won by Linda Williams with 'Het is een wonder'), but the two songs were released as a single. 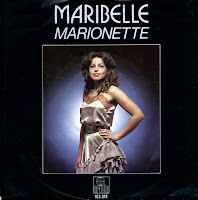 It became a small success for Maribelle: the single reached the Dutch Top 40, where it peaked at number 36 during a four week run. If it wasn't obvious already, I have a built-in loathing of Dutch music. Most Dutch productions are cheesy and substandard, while most Dutch artists think the world of themselves. So I approach Dutch contributions to the Eurovision Song Contest with caution - and more often than not, I find them downright appalling. More than a decade after Maribelle represented the Netherlands at the Contest in 1984 and finished 13th, my friend played me his copy of the single. It was quite a shock to find that 'Ik hou van jou' was actually a true classic. Not because of the cheesy lyrics or the slightly overemotional rendition by the singer, but for the sheer beauty of the melody the orchestra plays. After I got the Dutch single I went looking for the English version. This single is actually quite rare, since it wasn't a hit anywhere.